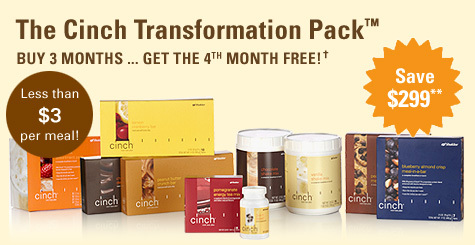 News: Cinch Diet Plan Special Extended! Over the weekend, they released an extension to the special. This means that the "4 months for 3" deal is back on. Until July 31, anyone can sign up for this great offer and get a fourth month of Cinch free for buying 3 months-worth. That brings the monthly cost down to about $225. 1) Sign up with a $70 purchase and get the free Cinch Sampler pack. 3) Or - just take the dive like I did and go ahead and commit to changing your life with 4 months of filling, energy-filled supplements. OK, that's quite a pitch, I know. You'll have to excuse me. After ten days and seeing both pound and inches disappear, I can get excited about this stuff. And don't take my word for it. Check it out for yourself. All the data you need is located at that last link.